The MonkeyFix extension fixes some SeaMonkey interface issues - such as adding support for popup ALT attributes - as well as adding some handy features for developers. It offers quick access to some of SeaMonkey's hidden preferences, and a few toolbar buttons that may be helpful in exposing extra functionality. It can also make SeaMonkey feel a lot more like Firefox 3, by allowing the tabs toolbar to be tweaked to look similar, and adding buttons for things like Bookmarks and History. Please feel free to contact me if you have any bug reports or suggestions for improvements to MonkeyFix. You can download/install MonkeyFix from the Mozilla add-ons site. It's distributed under the GNU General Public License, V3. Some of the major features of MonkeyFix are covered below. By default, SeaMonkey's behaviour is to popup the TITLE attribute of an image, but not the ALT attribute. Although this is reasonable behaviour, it can be helpful to be able to see the ALT attribute of an image because historically it's been used to convey extra caption information that's not otherwise available. There are still some major sites that do this. MonkeyFix allows you to configure SeaMonkey not just to popup ALT attributes for images, but a whole host of attributes for any element on the page. This can also be useful for quick debugging purposes. When custom popup ALT attributes is enabled, one node will be surrounded by *stars* in the popup. These stars simply indicate which node is being hovered over, as opposed to one of its parents - MonkeyFix can search up the DOM tree looking for the requested node attributes if they weren't found on the node being hovered over. SeaMonkey has long supported the ability for users to customize their source viewer, rather than using the internal source viewer. However, this functionality is not very visible and is only accessible using preferences. MonkeyFix offers a source viewer customization dialog and a 'View source' toolbar button for convenience. MonkeyFix adds some useful toolbar buttons to SeaMonkey's browser that Firefox has had for a while, allowing quick access to various parts of the interface (like the sidebar and downloads dialog). These can be accessed by right-clicking on the toolbar and selecting 'Customize'. A toolbar widget that animates to indicate when the current tab is busy. SeaMonkey supports a 'work offline' feature which will prevent it from connecting to the internet to refresh its cache of a webpage. MonkeyFix offers a toolbar button to make this functionality quickly and easily accessible, toggling between working online and working offline mode. When the browser is in working offline mode, it will attempt to fetch requested content from local cache and not connect via the network to retrieve it. To get content that hasn't been cached, the browser must once again be switched into working online mode. 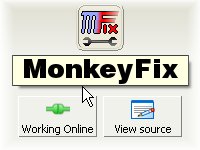 The main MonkeyFix configuration dialog has many tweaks for developers and power users who may wish to customize various behaviours of SeaMonkey and parts of its interface. Often these features would be hidden in the 'about:config' section of SeaMonkey. In some cases, they are implemented by MonkeyFix itself as no config setting for the tweak exists.